Many of those who begin Czech research will find out that their ancestors were from Prague - or at least the family says so. Well, not all people could be from Prague, right? 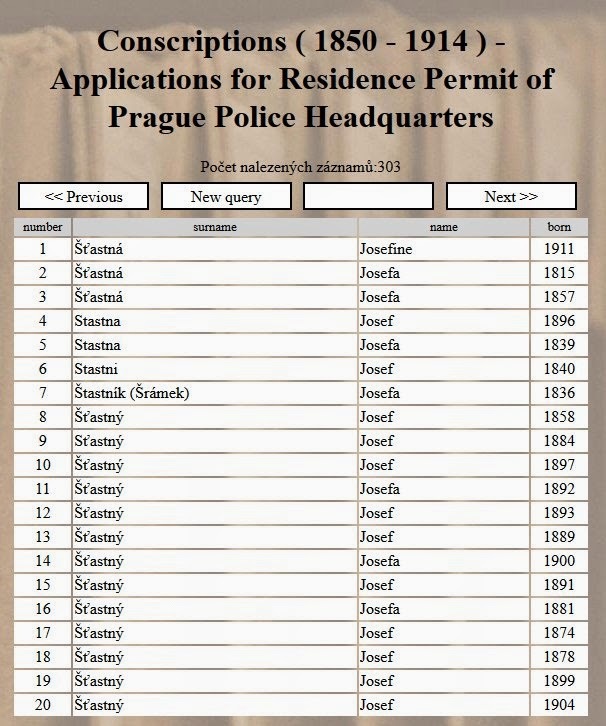 But there are ways how to find out if the people were living in Prague or not - one of those ways are Prague police conscriptions which are available online on National Archives of the Czech Republic website. Prague conscriptions covered these eight quarters as well as few others as the Prague Police Headquarters was in charge for surrounding villages too. These other villages were: Břevnov, Strašnice, Karlín, Podolí, Dvorce, Nusle, Pankrác, Vršovice, Michle, Smíchov, Košíře, Bubeneč, Podbaba, Šárka and Dejvice. 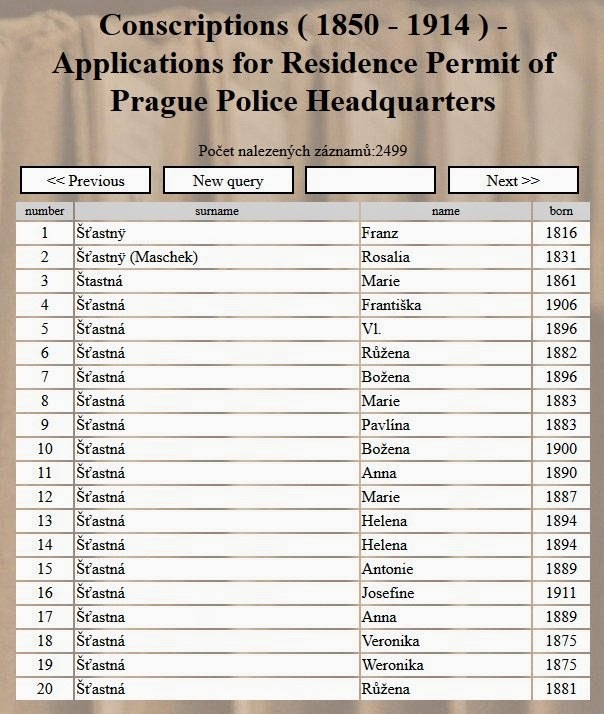 If your ancestors were from mentioned Prague quarters or surrounding villages they should be covered by the conscriptions. The conscriptions available online cover years 1850 til 1914. People there are therefor born during 19th and beginning of 20th century. Almost anyone who emigrated in the mentioned time span and lived in the mentioned quarters/villages should be present in the conscriptions. Should be - but of course some of the conscriptions were lost, destroyed etc. I have randomly chosen one Josef from the list - he is on third page, no. 51, Josef Šťastný born 1845, just to show how the conscription could look like. 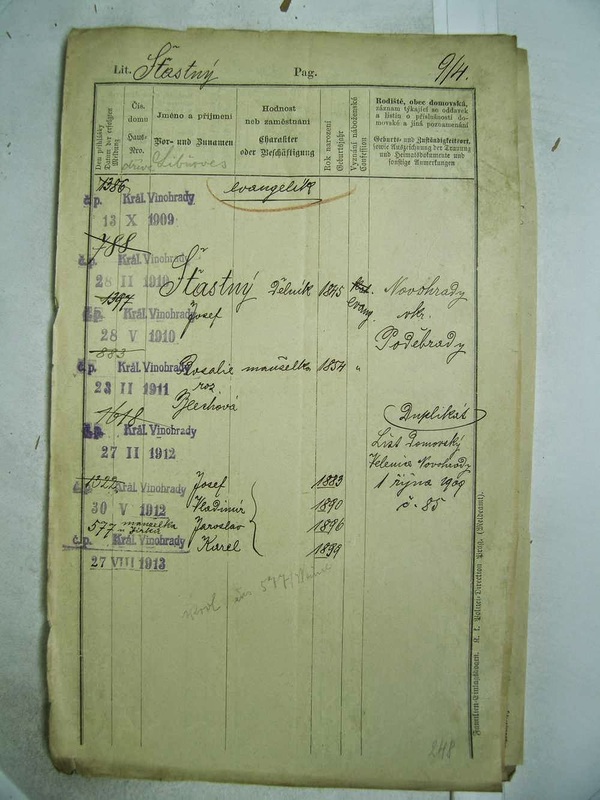 The conscriptions contain quite much information - addresses where the family lived, names of family members, their occupation or status, dates and places where the family members were born or where they had their domicile rights. There is the head of the family listed on first place - usually a father/husband, less usually a widow. Then his wife and children, sometimes house staff. Information contained there is in Czech or German - depended on the family and/or the clerk who wrote down the information. Most important part usually is the village where the family came from because it gives us a clue where to search next. Hi Blanka, I find that the site is not stable. When I save a link and want to go to it again it brings up something totally different. I now cannot find a conscription for Anton(in) Vyborny, born 1827 or Jaroslav Vyborny, born 1872, which I did find in the past. Do you have the same problem? Yes, I have the same problem. The easiest way is to save that picture directly or screenshot of it. Oh, if you had only found a Josef Šťastný (Stastny) born in April 1856. That could well have been my great-grandfather! Hi, after some digging I've found multiple conscriptions of an ancestor of mine, each with 1858 as the birth year, however on one, for the same person the year was written in as 1858 and then crossed out and rewritten as 1866. Do you know why this might have been done? Wow, this is excellent, Blanko! I really appreciate you letting us know about this wonderful resource.